Thank you so much for the positive response to the pin cushions I launched last week, it was lovely to hear stories of pin cushions being discovered in inherited sewing boxes and now being brought out and used again. 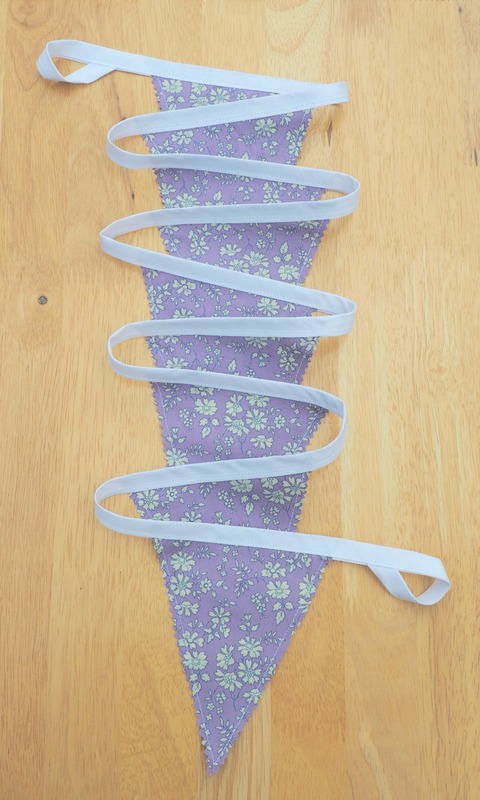 Today I'm profiling the next of my new product launches - bunting! Who doesn't love bunting? It went through a bit of a craze a few years ago and was literally EVERYWHERE, but I think it was probably fuelled by patriotism here in the UK with both the Olympics and the Queen's diamond jubilee in 2012,and endless summer street parties crying out for quick, easy and colourful decorations. Now things have settled down a bit but there still seems to be plenty of love for bunting, a hint of whimsy and nostalgia as well as something so simple that brings a smile to the face. I also think its a thing that transcends generations and offers variety of choice and preference in colours, fabrics, lengths and finishes. My bunting is all made from a selection of fabrics from my stash - leftovers from clothes I've made, inherited and found pieces, as well as those I've bought on a whim because the colours or patterns attracted me. I've also got some with that extra touch of luxury made from scraps of Liberty Tana Lawn in a few different prints. I've got a few examples listed for sale in my Etsy shop so far, but more will be coming soon! OK, let's talk Liberty first - here are three strings of bunting in Tana Lawn cotton; the first a rich purple base with tiny scattered gold diamonds, the second the classic Capel print in lilac, and the third a swirl of pale blue with an art nouveau inspired print. Each string has nine flags/pennants attached to plain white bias binding, with loops for hanging at each end. The flags are sewing matching back-to-back so the bunting can be displayed from both sides, and the edges are pinked for a zig-zag finish. Each string measures 165cm (65 inches) from end to end with the flags spaced about 6cm (2.5 inches) apart and about 13cm (5 inches) tall. The Liberty cotton is of course deliciously soft and silky to touch, and I think these would be great for indoor decorations, perhaps across shelves or around the head of a bed. 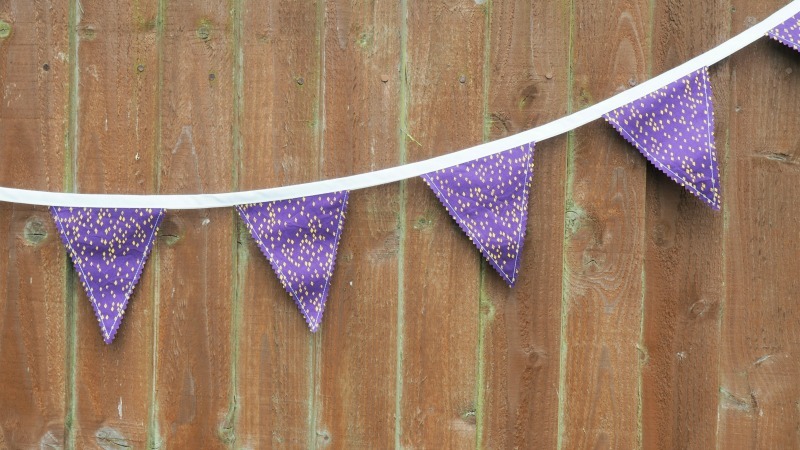 The other bunting currently available is two strings made from a mixed collection of ditsy floral print cottons. Using the same print in different colour combinations means the fabrics all co-ordinate creating a lovely relaxed vintage look. Again, the bunting is reversible with 13cm (5 inch) tall flags. One string has nine flags, and is slightly shorter than the Liberty ones - it measures 135cm (53 inches) with the flags spaced at 1.5cm (5/8 inch) apart. The second string is longer with 15 flags and measures in at 225cm (90 inches) with the flags 2.5cm (1 inch) apart. These are made from a slightly sturdier weight quilting cotton (as well as the white bias binding) so could probably stand to be outdoors in good weather, perhaps for a summer barbecue or party. Just to mention - the differences in length and flag spacing are a result of experimenting with different finishes and effects, so do let me know which you think works best. I'm also happy to discuss bespoke requests for bunting if you have a particular colour theme or specific fabric in mind, as well as different length requirements - just drop me a message and I'll get back to you. So there we are, more pretty new things in my Etsy shop - let me know what you think, are you a bunting lover? I feel like I want to festoon the whole house at the moment as I'm having so much fun making it! Quick reminder - I'll be at the Support Local Pop Up on Saturday 1st July at One Warwick Park Hotel, Tunbridge Wells from 10 - 4. It's free to get in and there will be a range of different stalls and sellers, so do pop in and say hello if you're in the area - I'm getting a bit nervous about it so a friendly face would be lovely!